These helpful resource tools are specifically intended to assist practicing pharmacists strengthen interactive relationships with their patients, and offer practical guidelines in the delivery of treatment options. This resource is designed to support pharmacists who provide care for patients with chronic obstructive pulmonary disease (COPD). It provides an overview of treatment options, strategies to reduce hospital readmissions, approaches to engage patients with COPD in their care, a review of inhaler selection, and a discussion of access issues. In 2017, APhA conducted a survey and convened a virtual advisory panel to explore the impact of “nonmedical switching” on the care and treatment outcomes of patients with diabetes. This report summarizes survey findings from 364 pharmacists, and presents results from 8 expert panelists on nonmedical switching and utilization management. This resource tool is designed to support pharmacists’ consultations with patients with osteoarthritis. The tool offers motivational interviewing strategies to engage with patients, and pharmacologic options for treatment therapies. The Pain Relief in Brief is a practice tool used to guide pharmacists in assessing patient complaints of pain, selecting analgesics that are appropriate for patients, and educating patients on appropriate OTC analgesic use. 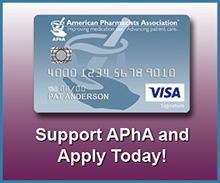 This helpful pharmacist resource tool is supported by an independent grant from McNeil Consumer Healthcare. This practice tool, developed by APhA in collaboration with the American Chronic Pain Association (ACPA), discuss the pharmacist's role in pain management, recommends strategies for engaging patients with pain, and provides useful tools to support pharmacists' interactions with patients. Download the Resource. In 2016, APhA conducted a survey to explore pharmacists’ current diabetes management activities in community settings and assess pharmacists’ familiarity with emerging insulin products. This visually-enhanced, statistical report summarizes the findings – obtained from interviews, discussion groups and survey results. This practice tool is a useful resource to assist and support pharmacists when consulting with patients about pertussis (whooping cough). It provides helpful information for pharmacists to consider when assessing, recommending, administering, and documenting Tdap vaccinations. This patient education brochure is intended to help consumers better understand the benefits, risks, and safety about dietary supplements. It lists the “do’s” and “don’ts” when using dietary supplements, and briefly describes which sources consumers should consider when selecting dietary supplements. In 2015, APhA conducted a survey to explore the role of pharmacists in supporting self-treating patients and gain deeper insight regarding how pharmacists engage with patients in community pharmacy settings. This visually-enhanced, statistical report summarizes the findings – obtained from interviews, discussion groups and survey results. Download the report. The Pharmacist-Patient Guide is a practice tool for pharmacists that offers current, efficient and to-the-point clinical information that can be quickly and easily incorporated into busy practices the very same day. This guide and accompanying informational webinars are intended to (1) update pharmacists on treatment of very high triglycerides (VHTG) and (2) assist pharmacists in counseling/educating patients with VHTG on the use of prescription omega-3 products and dietary supplements. *Please open printable Pharmacist-Patient Guide as a reference prior to launching this instructional video. This practice tool provides evidence-based, peer-reviewed content on 10 commonly used dietary supplements, including sample patient consults, common uses, dosing, key counseling points, and safety.